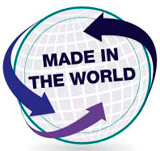 WTO | Made in the World - Trade in value added: what is the country of origin in an interconnected world? Traditional trade statistics record trade across borders on a gross basis, thus double or multiple-count vertical trade or flows in intermediates. Trade in value added allocates the value added to each step of the supply chain across countries. It allows incorporating the specificity of the new business model on which global manufacturing is based. To be able to quantify the part of imported inputs in an economy’s exports, different statistical approaches are used. Case studies — Can links of trade and business registers help to derive microeconomic data? Examples date back as far as 1998 when a WTO Report described that only 37 per cent of the production value of a typical American car is generated in the US. (2) Others include Apple’s iPod, iPhone or iPad, Mattel’s Barbie doll, or Nokia’s N95. However, trade statistics remain arbitrary. Product definitions do not always allow distinguishing between intermediate and final use. For example, is packaged software an intermediate or a final product? Another limitation is that BEC only classifies goods. There is no similar classification for services. In the context of offshoring, computer and information services as well as other business services are often used as proxies of intermediate services. International input-output (II‑O) tables gather national accounts and bilateral trade data on goods and services into a consistent statistical framework. This approach is often referred to as indirect measurement of value added trade and results in estimates, while above-mentioned case studies or analysing trade in intermediate goods are considered a direct measurement. II-Os tables allow decomposing the value added contained in exports into its foreign and domestic contents. The import content of exports is also known as vertical specialization (6). The rationale behind vertical specialization is for companies to benefit from comparative and productivity advantages at different stages of the production process. It is clearly associated to trade in inputs, caused by international production chains and the development of outsourcing and offshoring strategies from multinational enterprises. The domestic content of exports is a measure of exports net of imported inputs (7). It corresponds to the accumulation of the value added incorporated by each of the various domestic sectors that contributed to the supply chain.